If you want to boost performance on your 2010-2014 Ford Mustang and Shelby models, Shelby Performance parts now offers a new wide body kit that was first introduced on the 2013 Shelby GT500 Super Snake at the North American International Auto Show in Detroit earlier this year. Now owners of new generation model Ford Mustangs and Shelby cars can put more meat on the ground for better traction and performance. Where do owners get the new kits and where can they be installed? The performance-boosting 2010-2014 Mustang and Shelby kits are available in two versions. The complete package includes rear quarter panels, adding 6 inches of fender to house up to 13 inch rear wheels, as well as the front quarter panels that allow for 10 inch front wheels. This will give current-generation Mustang owners the ability to put more rubber and traction on the road and track. Owners can also choose the rear-only option if they just want big rubber on the rear only. Shelby has announced that the rear only package for 2010-2014 Mustangs and Shelby’s starts at $3,399, and the four quarter panel kit is $5,999, not including wheels and tires. 2010-2014 Ford Mustang and Shelby owners can now get the “Shelby Magic” through Shelby branded styling and performance parts,” said Shelby American President John Luft. The new wide-body kits are available at www.shelbyperformanceparts.com or customers can call 702-405-3500 for more information. 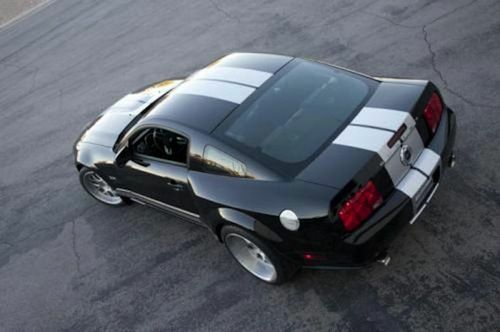 Watch 2013 Shelby GT500 Super Snake Wide-body video.